Allseating ZIP Mesh Back Drafting Chair  Free Shipping! Introducing the ZIP mesh back drafting chair from Allseating. This drafting chair features a full horizontal mesh backrest for maximum breathability and support to help the user stay healthy, happy and productive throughout the workday. Other features of the ZIP stool include pneumatic seat height adjustment, 360-degree swivel, tilt with tilt lock, tilt tension adjustment, adjustable height and width T-shape task arms, chrome finish foot rest and a heavy duty five star nylon base with dual wheel carpet casters. Other caster options available for a minimal charge. 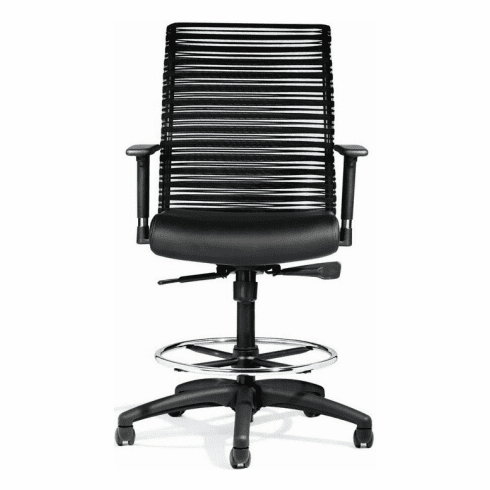 This mesh back drafting chair is rated for a (40) hour work week and has a weight capacity of 325 lbs. Meets or exceeds ANSI/BIFMA standards. Dimensions: Back Size: 22"H x 19"W. Seat Size: 20"W x 18"D. Seat Height Adjustment: 21" - 29"H. 10 year warranty from Allseating. Normally ships in 3-4 business days from Toronto, Canada.